Every few years, before the Jordan Reunion in Exeter, family members install a new flag on top a hill in Yokohl Valley. The flag pole used is the old flag pole from the Yokohl Valley School. It is well over 100 years old. Although quite weathered it still is functional. This picture shows the pole hinged to the ground ready to receive new hardware and flag. After installation, the flag is raised by family members. Making the trip this year was, L to R, Stan Maze, Leland Jordan, Mike Maze, Mike Thomas, and not pictured, Jim Jordan and Larry Jordan. 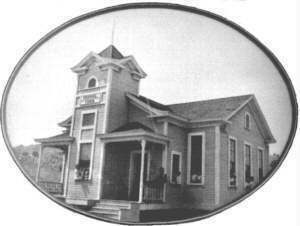 This is the Yokohl Valley School as it appeared many years ago. When the school was abandoned, the flagpole was moved to the hilltop where it is still used today.